How do you achieve effective low-carbon design beyond the building level? How do you create a community that is both livable and sustainable? More importantly, how do you know if you have succeeded? Harrison Fraker goes beyond abstract principles to provide a clear, in-depth evaluation of four first generation low-carbon neighborhoods in Europe, and shows how those lessons can be applied to the U.S. Using concrete performance data to gauge successes and failures, he presents a holistic model based on best practices. The four case studies are: Bo01 and Hammarby in Sweden, and Kronsberg and Vauban in Germany. Each was built deliberately to conserve resources: all are mixed-used, contain at least 1,000 units, and have aggressive goals for energy and water efficiency, recycling, and waste treatment. For each case study, Fraker explores the community's development process and goals and objectives as they relate to urban form, transportation, green space, energy, water and waste systems, and a social agenda. For each model, he looks at overall performance and lessons learned. Later chapters compare the different strategies employed by the case-study communities and develop a comprehensive model of sustainability, looking specifically at how these lessons can be employed in the United States, with a focus on retrofitting existing communities. This whole-systems approach promises not only a smaller carbon footprint, but an enriched form of urban living. The Hidden Potential of Sustainable Neighborhoods will be especially useful for urban designers, architects, landscape architects, land use planners, local policymakers and NGOs, citizen activists, students of urban design, planning, architecture, and landscape architecture. "As our world faces increased urbanization and climatic changes, Fraker explores the critical role of urban design and integrated, systems approaches for realizing low-carbon, resilient, socially and environmentally enriched built environments. He does a masterful job of examining case studies and exposing lessons learned as a model for future neighborhood development worldwide." "Wiser, more determined environmental stewardship will, of necessity, be part of all of our futures. An excellent way to get beyond the rhetoric of sustainability and to actually get started is to read this compelling book about those who already have and the places they are building." "This book shows how to take full ecological advantage of the neighborhood, which has proven such a resilient and universal digit of urbanism. The design savvy and elegance brought to life in these four case studies weds state-of-the-art architecture, engineering, and urban design. No one is better suited to accomplish this than Harrison Fraker, with his illustrious career of research and practice in energy-conscious and sustainable design." "A handful of color photographs illustrate this excellent and insightful resource, highly recommended especially for urban and suburban planners with an eye toward long-term sustainable design." "...narrowly focused, using four European case studies to dig into the specifics of several low-carbon urban design projects....we should appreciate his effort to translate European lessons to messy American cities." "If you've been waiting for a book about sustainable neighborhoods with more tables and diagrams and system-by-system analyses than rhetoric, it's here..."
"In all, the book was unfailing in its ability to map down to the finest detail the way these four cities operated, and process that information into relevancy for a North American context. While others are talking about this, The Hidden Potential For Sustainable Neighborhoods is the first book I have seen to break it down in such accessible detail." 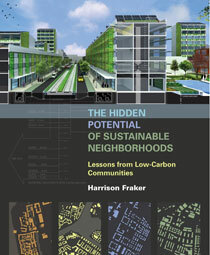 "Fraker’s book, replete with practical wisdom and compelling examples of strategic sustainability strategies validated by performance data, explores the efforts of four district-scale urban communities to achieve low-carbon and low energy goals using an integrated approach similar to the EcoBlock concept." "This book is definitely a must-read for students interested in following the LEED path...One of the biggest learning lessons are the public-private funding partnerships that were formed to build these sustainable neighborhoods and the involvement of the residents to measure and implement these changes."